Many people have lots of hours, days, weeks on the game popular game Candy Crush. Let's face it, it is a great way to pass time and also highly addictive! Does anyone know just how many levels there are to this game? 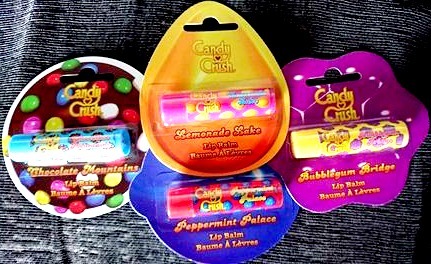 If you are a Candy Crush addict then you will be pleased to know you can now own your very own Chocolate Mountain, Bubblegum Bridge, Lemonade Lake and Peppermint Palace in the form of lip balms. So if you have ever been staring at the screen wondering what these places smell like now you need not wonder anymore. I have a slight obsession with lip balm, I have over 20. So I was excited to add these to my collection. I first just want to say that the packaging is great and I wouldn't expect it to be any other way, it replicates the game shapes and the colours perfectly. Of course my son immediately wanted to try them (he may inherit my lip balm obsession). As with most lip balms there is an age recommendation for these it is age 6, my son is 5 and I applied it to his lips for him. The lip balms have a smooth creamy texture which makes them easy to apply, I find some lip balms can have a tacky/sticky texture which aren't very pleasant. The scents of the lip balms are really nice and not to overbearing which is great. I liked how the lip balms didn't leave a slimy shine to my lips something else I find can happen with lip balm. 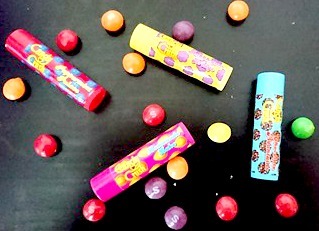 I didn't need to re apply the lip balm too much during the day when using either, meaning these will last a good while. You can find these lip balms in Primark for £1.50 they are great to give as part of a gift for a birthday or even at Christmas as a stocking filler. I think the price is fair in comparison to other lip balms but do think it would be nice if they had them available in a collection. Please note that we were sent four Candy Crush lip balms for the purpose of this review. However this in noway impacts on the thoughts and opinions expressed in this review.